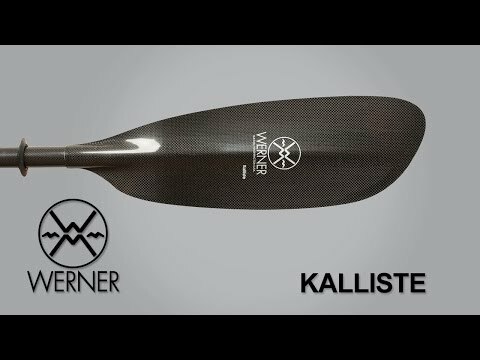 The Werner Kalliste Carbon paddle features the performance core blades that have an exceptionally light buoyant feel on the water and silky smooth strokes that make paddling all day long feel effortless. The Kalliste is the ultimate choice for low angle paddlers. All Werner carbon paddles are awesome! I own several. So light and well made. I was, at first, concerned that the super light-weight Werner Carbon Fiber Paddle would snap under my 200+# weight as I was leaning on it lifting myself out of the kayak, but it seemed super strong. Our session was only two hours but paddling felt effortless and I'm sure it will make a difference after several hours on the water. The weight difference between the Kalliste and my Werner Skagit is unbelievable. Should be a great summer with more energy left a the end of the day. Perfect combination of blade area vs. stroke power. Glad I spent the $$$. I have a bad shoulder and this paddle is so much easier to use than my old one, which will remain nameless. I can paddle for hours now and not get sore or tired. It is expensive, but worth it. I bought two Werner Kalliste paddles in the middle of winter in New York State. Snow and ice everywhere. Consequently I haven't used them yet but the are as light and easily adjustable as I expected. The manufacturing quality is very high. We'll use them in three months. The Kalliste is an excellent kayak paddle. So easy to use. It fell into place the first time I used it. The 2 piece makes it easy to transport. The adjusting ferrule allows it to be adjusted to each persons style. Well worth the extra cost. The paddle is awesome, very light and a bit of buoyancy feels great paddling. The service of ACK is even better. Ordering a whole bunch of stuff for an upcoming river tripping, I messed up a few orders but the guys here were very helpful and cool with it. Fantastic paddle. Almost feels as it's just floating there in front of you. So impressed, I bought a second as my spare. Worth the high cost, ACK has great customer service. I have a Hobie 9i (inflatable) and this is a wider kayak.. I made the mistake of purchasing a 220 and kept splashing myself...I finally bit the bullet and purchased the 240 and it has made all the difference in the world! I love this paddle and the lightness, durability and ease of use are unsurpassed (and I am considerably drier!) I also would advise purchasing one of the bags (make sure you find one that will fit the 240)..it is a little investment but pays for itself as you can store quite a few items in it, it protects your paddle in the car, and helps keep things organized. Regardless of the bag, I know it is expensive, but it truly is worth the investment. excellent product! light, strong, reliable, well designed. I bought two Kalliste straight shaft paddles 240 CM based on the reviews I read on them. We really couldn't afford them, but they have made a great difference in our kayaking experience. We look forward to going kayaking now. Before it was an ambivalent experience, the water and kayaks were great [Ocean Kayak Caper], but the wear on the shoulders and arms was not pleasant. Now it's a delight to pick up the paddle and shove off and go look around. We are not distance paddlers yet, but the paddles are still great. Although expensive, this paddle is worth every cent and then some. Although it is unbelievably light, the real advantage is its buoyancy that is most notable at the completion of a forward stroke. It just pops out of the water at the perfect moment. Also, the absence of a traditional reinforcing spline on the back of the paddle face makes sculling a piece of cake, which in turn makes rolling incredibly easy. Really couldn't afford this paddle but I have a tear in my shoulder I need surgery on that I'm putting off at least until fall or winter and wanted a lighter paddle so my shoulder wouldn't hurt so bad at the end of the day. Also wanted a lighter paddle to make my all-day paddling more enjoyable. LOVE this paddle!!! Worth the money!! Upgraded from Bending Branches Infusion which is 37 oz. Such a big difference! I would get worn out a lot quicker using that paddle compared to my new Kalliste! Also, much stiffer than the nylon blades which translates into less wasted effort through each stroke! Fantastic. I didn't believe it could be so good. It is! Yes this paddle is expensive but believe me it's worth every penny! Unbelievably light, well crafted and powerful. If you love to paddle, you should own one of these. If your not looking to spend money I'd advise you not to try this paddle because once you do other paddles just don't cut it. Excellent product. I use them on short (sprints of 2-3 miles) and longer workouts (6 miles or more) and definitely feel more comfortable during the workout. My only regret is not buying a longer length paddle as I am 6' and only got the 220cm. I never knew a paddle could make such a difference. The paddle that the Werner Kalliste replaced was fiberglass, and I'm never going back. The Kalliste is unbelievably light. It enters the water easily and seems to pop right out automatically at the perfect moment the stroke is completed. The carbon material ensures that there is so little mass at the paddle ends that long distance paddling becomes effortless. Yesterday I took this paddle for an eight mile trip from the Montery Bay to the open Pacific Ocean, and I could have easily paddled another eight miles. Sheer perfection! I talked to a lot of people before I made the trip to ACK and then talked to the folks at the store in Austin. The comment I received from pretty much everyone was to buy the best paddle I could afford. I then narrowed my choice to the Kalliste and could not be happier with the choice. I am a kayak fisherman and on a day of fishing I may cover 8-10 miles. This paddle makes the day effortless with it's balance, light weight and the way it slices through the water. I also separate the halves and use one half to "troll" with, it's that light! My first paddle and will be my last as there is none better. Unbelievably light. Very happy in this Werner Kalliste paddle. My God! I figured that it would be a better paddle than my Camano, but I was not ready for the difference. The Kalliste is effortless. Smooth. Feather light but no flutter in the paddle. Almost silent as it enters the water. What a great paddle. Q: Size question on the Kalliste, what size to get for someone 6'.5" in hobie compass, which is 34 inches wide. In REI website, it says 240 cm, but should it be 250cm. Also, do you guys carry 250cm size, I don't see it has an option.